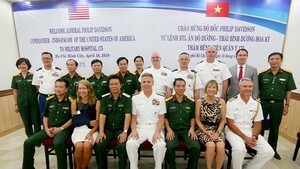 Vietnam National Institute of Maritime Medicine yesterday inaugurated a state-of-the-art Telemedicine system, connecting medical facility in Bach Long Vy island of Hai Phong city, the institute and the Viet-Tiep Hospital. Speaking at the inauguration ceremony, Deputy Health Minister Nguyen Viet Tien lauded the institute’s efforts and relevant agencies that operate the state-of-the-art medical system to meet the treatment demand of inhabitants in Bach Long Vy island and fishermen offshore. The system also helps improve medical treatment for residents in northern island. With the system, island inhabitants and fishermen will receive medical check-up performed by leading medical workers.